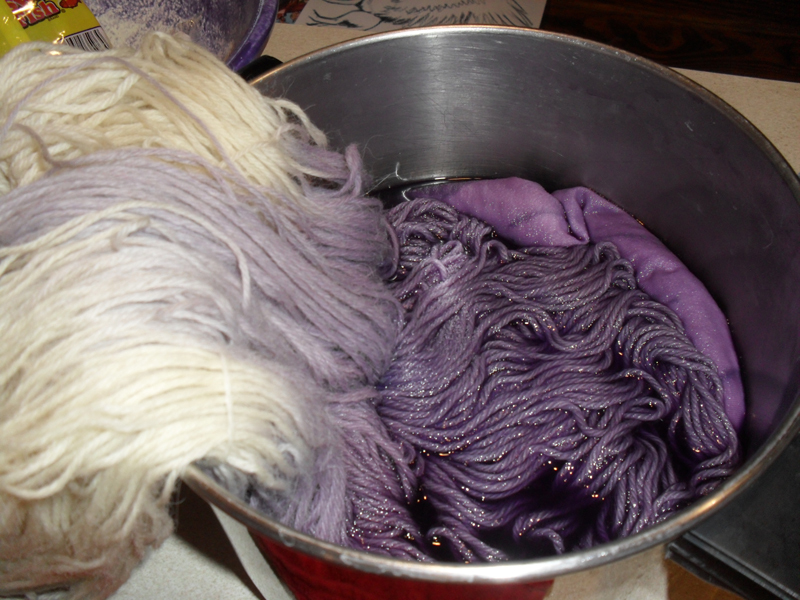 After having played with the alpaca fleece, I felt ready to do the “big project,” the reason I had spent so many hours learning to dye. While Rebecca likes sports weight yarn, I love worsted weight. So I had bought 5 giant hanks of Valley Yarns Stockbridge, undyed worsted weight yarn, each 250 grams, 545 yards. They are alpaca-wool blended 50-50. Seeing all the colors I had played with, my husband challenged me to make at least one hank multicolored. I rather thought that was a good idea. I needed to learn about how yarn WICKS, and I thought I again could learn more before plunging my precious skeins into my 9 pounds of pokeberries. It took me 2 days to mordant everything. My pot is only 14 quarts, and thus only fit 2 of these skeins in at a time. So I did 4 of them in 2 batches. However, I did 1 skein in 2 mordants! 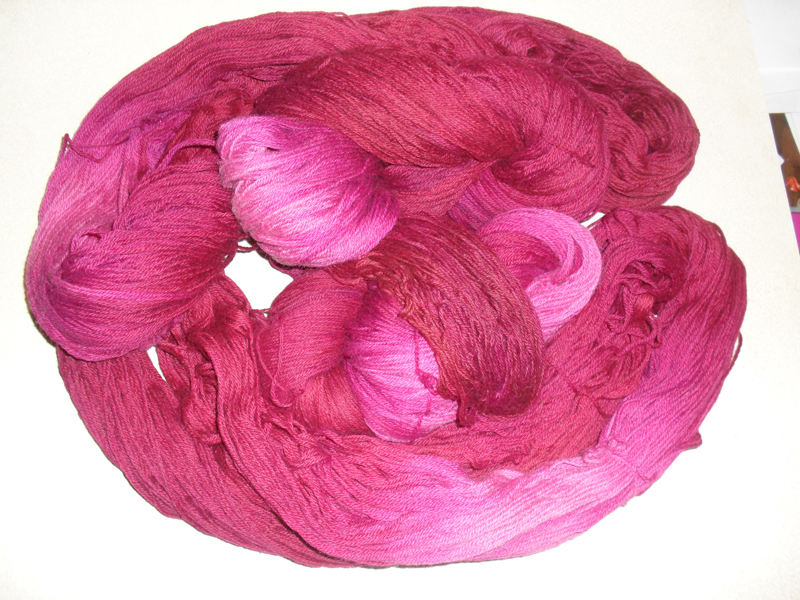 The skein was held together by 3 loosely tied strings. On one of them I tied a piece of red yarn (visible in pot); on another I tied a piece of yellow yarn, and on the 3rd string I tied a piece of blue yarn. That way I could remember which end I died in alum, and which end I died in white vinegar. 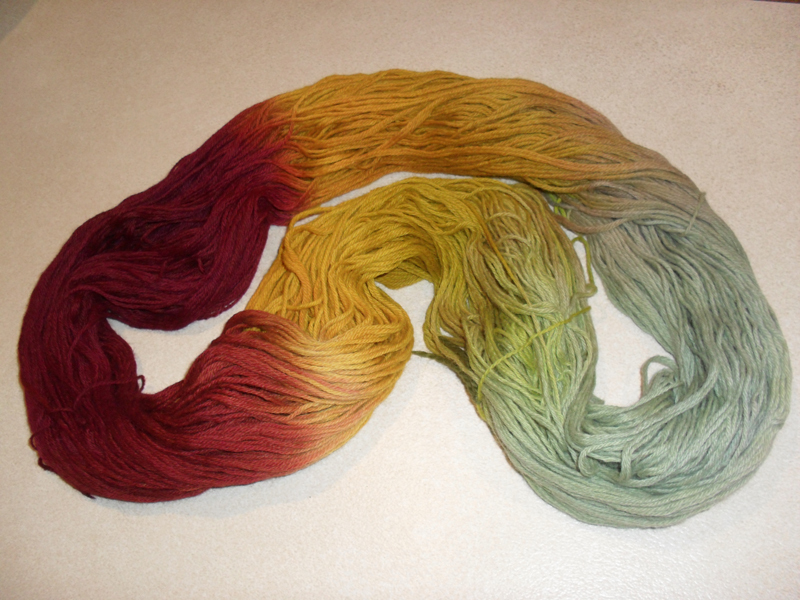 I allowed the alum and vinegar to absorb into the yarn but I left a small blank area in the middle. However, I made a mistake here. 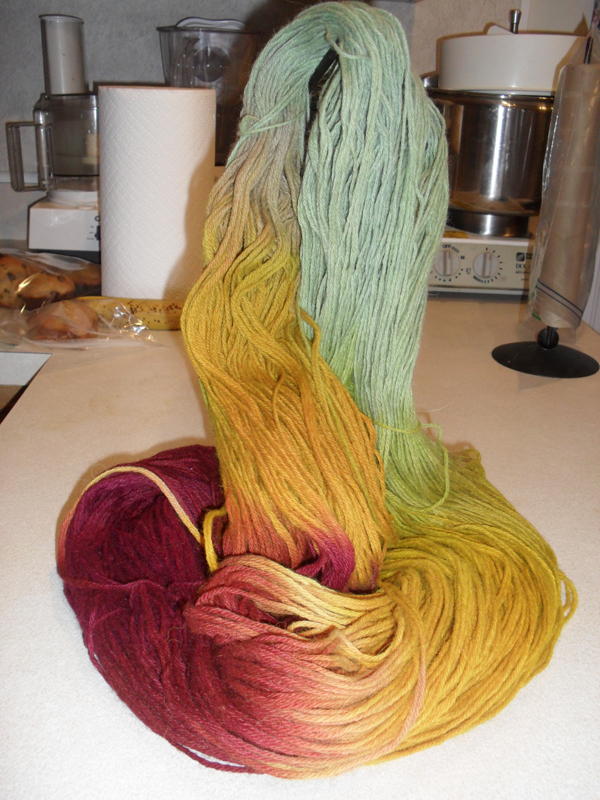 I allowed the yarn in the middle to dry out…..esp. on the vinegar side which I did first. Thus the wicking stopped suddenly rather than having a more random, interesting ending. This shows up in the finished product you’ll see in a minute. After letting the mordants sit over-night, I started with the blue dye. There’s also one of Bethany’s T-shirts in there, so ignore that. (Bethany is my 9-year-old daughter….another artist in the making….She had ruined one of her shirts with a sharpie-picture-gone-wrong so I thought I’d see what the blue dye could do on cotton.) You can see that the wicking of the blue dye is happening nicely on this side. You can see signs here of the blue having wicked its way all the way to the red end! 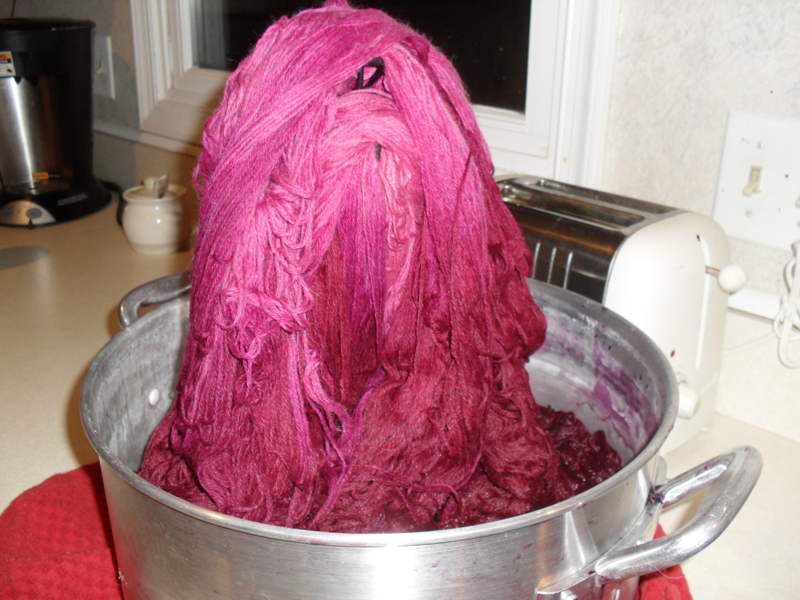 I left that in the pot and plunged the other end of the skein into the pokeberry pot, and heated it gently. Since I had prepared 9 pounds of pokeberries for all 5 skeins, it was hard to know exactly how much to put into this pot for just this one end of yarn. Well, I guess wrong. It was my second mistake. I put too much and the color turned out too dark. 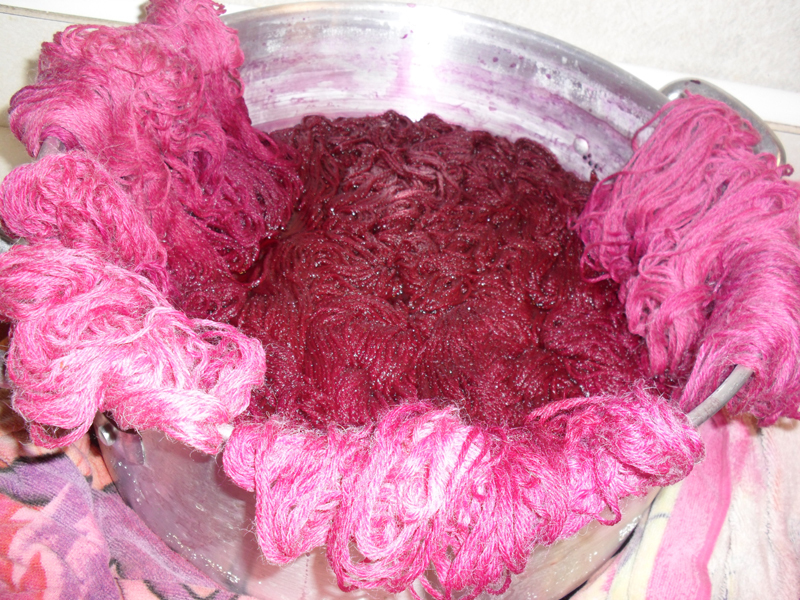 Plus it stopped suddendly due to the way the mordant absorbed into the yarn. 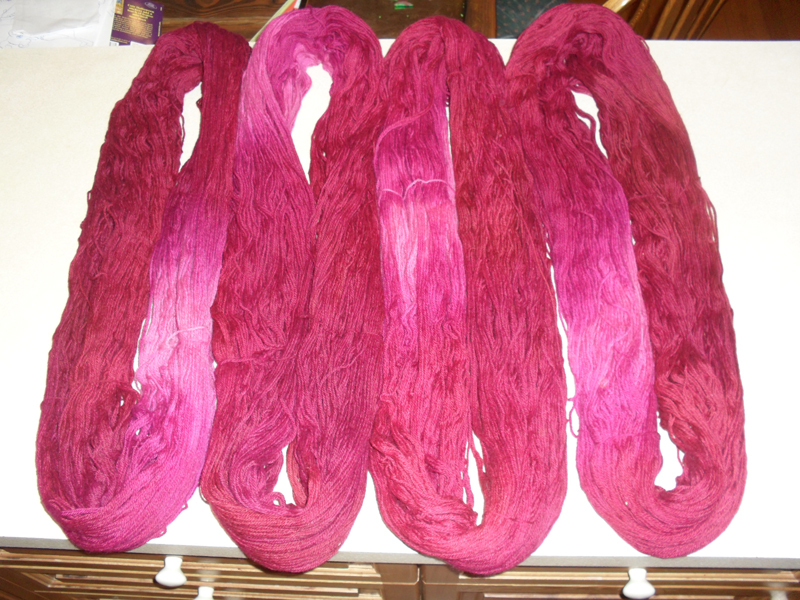 I managed to make a gorgeous deep red, but it’s too much for this skein. Next came the yellow middle. I think I have proved beyond all doubt that Tumeric is an amazing dye. It is happy with either mordant or NONE!! This method I am using has a lot of potential if I can master the wicking of the yarn. The tumeric happily blended with the blue, and what red it could. 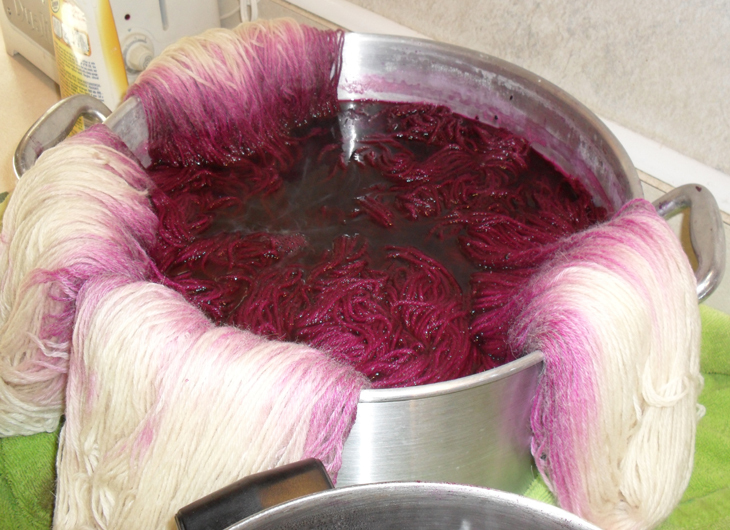 Unfortunately, because I had dyed the red so deeply, there was not much room left in the yarn molecules for anything else. So there isn’t much orange on my skein. However, on the blue side, the tumeric was very aggressive! It kept wicking its way through the blue to the point that I pretty much lost the original pretty light blue….my third mistake. What do you think? It’s OK I think, but I can’t wait to try again, now that I understand better how the wicking happens. 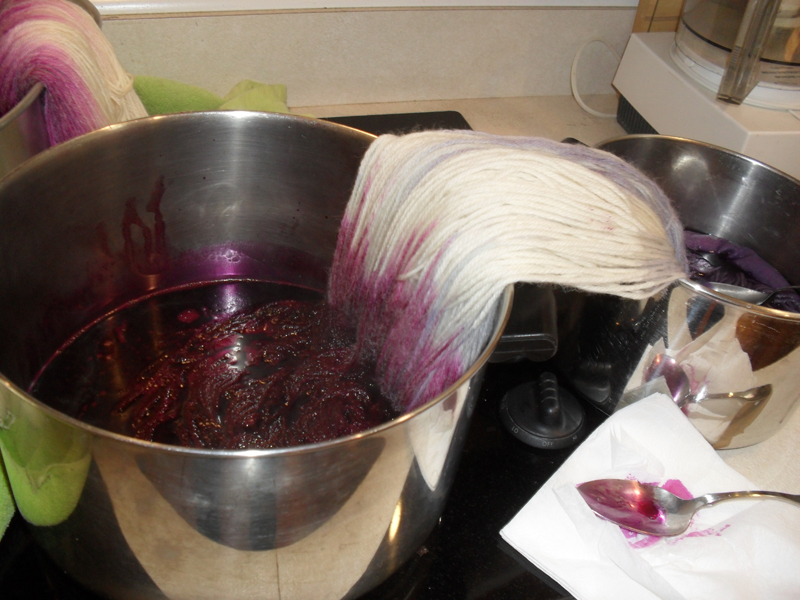 Armed with that knowledge, I began dyeing the 4 remaining skeins in the rest of the pokeberry juice. I really wanted the skeins to be as identical as possible, so I determined to put them all in the same pot. 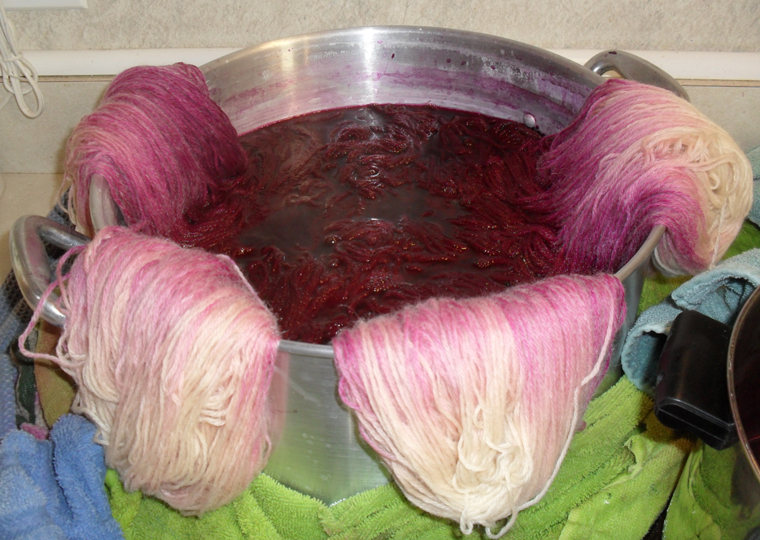 I squeezed them all in there, and made sure they were all wet so there would be no abrupt end to the capillary action of the dye into the yarn. The wicking starts right away and is fun to watch. I place towels around the pot as it gently heated up and eventually simmered for one hour. After an hour, it didn’t seem like the dye was very red, so after I let it cool down for a couple hours and thought about it, I heated it back up and simmered it for another 45 minutes. Isn’t that cool?! I wasn’t sure how much it would absorb into the places not in the pot. 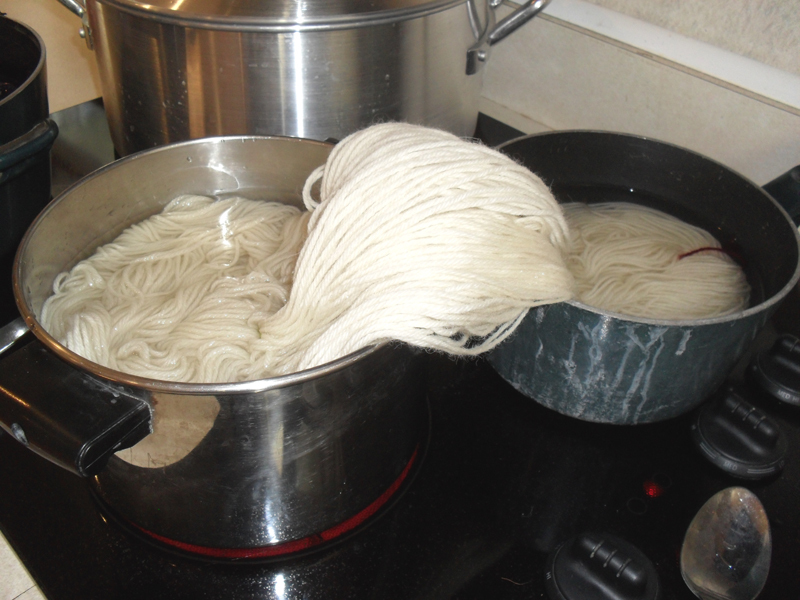 I didn’t know if I should actually place the whole yarn into the pot. I was guessing all the way. I didn’t want any white…..I was shooting for a semi-solid red. Rebecca has done this beautifully herself. 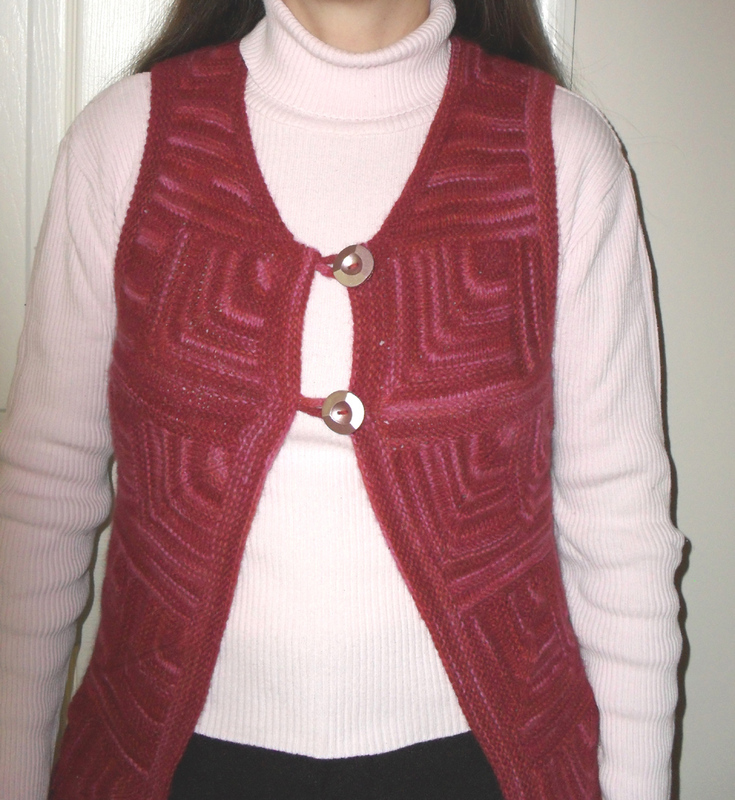 I bought some semi-solid red from her last winter and made a vest with it. So that’s what I was aiming for. After several hours, the wicking spread onto the counter and my husband’s inventor mind was conjuring up how to help me for next time. That got me thinking, and in the end I used a banana holder. 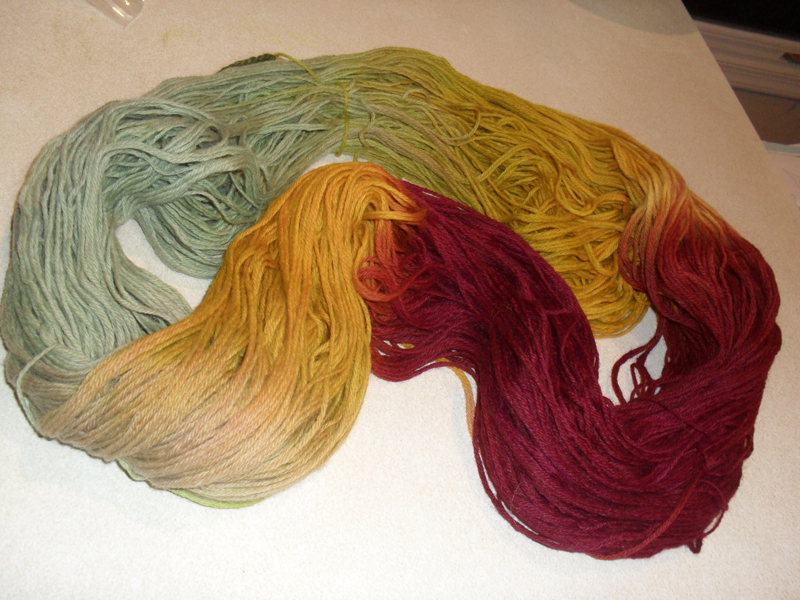 I did end up dunking the lighter end into the dye bath to make sure there were no “blank” spots. I wish I had done it a bit more I think. The pinks and reds are wonderfully deep, so for a true semi-solid, there should probably not be such a light spot in the skein. But I’m pleased with this first effort….as much as a critical artist can be I guess. Now I have 2,180 yards of worsted weight wool-alpaca! And right after I finished this, theVogue Holiday 2010 magazine arrived on my door step with about a dozen red patterns in it! I was tickled. 1) What is wicking? I have never heard this word… I can guess but is this something you learned about in your books? 3) I love the multi color!!! That is actually a color I wanted to try for my sock yarn. I do not think the red is too dark. I just like it being wild and crazy and letting it do what it wants; its okay that the hues do not all match in their dark-ness. 4) The banana holder is brilliant! We have one but I never buy bananas so that is perfect. I will try that next time. 1. a bundle or loose twist or braid of soft threads, or a woven strip or tube, as of cotton or asbestos, which in a candle, lamp, oil stove, cigarette lighter, or the like, serves to draw up the melted tallow or wax or the oil or other flammable liquid to be burned. 2. to draw off (liquid) by capillary action. Thanks for explaining what you did in your yarn. I think I have an example of both at home and that helps. Thank you also for your enthusiasm and kind words over my effort. It was very sweet! Thank you for the tip. I found some pokeberries still left on the bushes (due to all the mild weather we’ve had?) so I over-dyed the ends that I thought were too light. 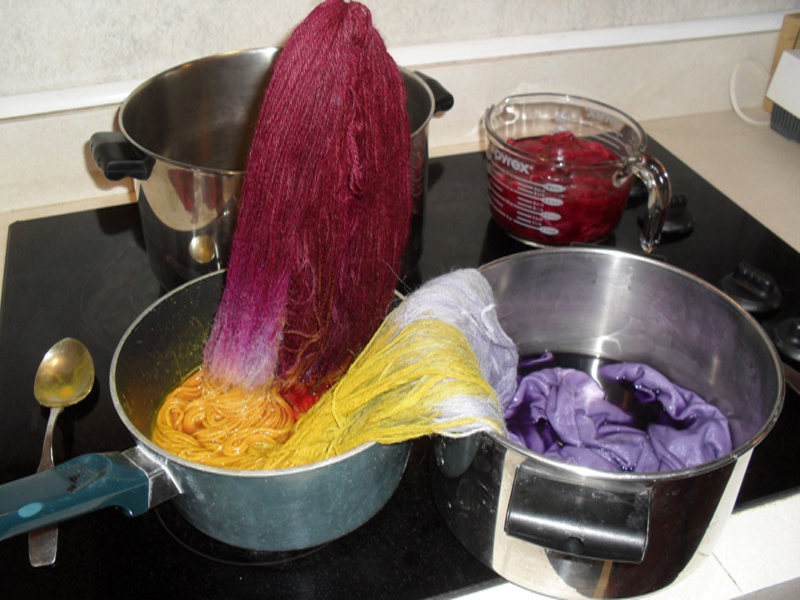 I wetted down half of each skein, put the ends in a dye pot, and gently heated for 10 mins. and left them in for a total of about 15 mins. like you suggested. That took care of it nicely and now there is the more subtle variation that I was looking for.